As a Coro fellow, Neti is learning the ropes of non-profit fundraising, event logistics and consulting at the YWCA Greater Pittsburgh and Homewood Children’s Village. And she is building her own non-profit organization, WE Education, with Zora Gilbert (DC’16). Through WE Education—which Neti founded when she was a senior at CMU—high school students from Pittsburgh’s Homewood neighborhood are trained in modules where they learn basic software and coding skills, create a financial plan and gain an understanding of issues affecting their communities. With the guidance of a mentor, the fellows will apply these skills to a community development project of their choice – from executing an event to building an app. “WE Education is dedicated to giving our fellows the agency and skills they need to become change makers in their own communities,” she said. But she acknowledged that this can be easier said than done. Neti is one of 15 members serving on City of Pittsburgh Mayor William Peduto’s LGBTQIA+ Advisory Council, which will make recommendations for internal and legislative policy affecting Pittsburgh’s LGBT community. “Since the election, it's become really important for me to get more involved locally and with the issues that matter most to me. This council was the best start in that journey,” said Neti. “LGBT issues in Pittsburgh are near and dear to my heart." Another common thread through Neti’s work is bridging the gap between technology and the humanities. For example, Neti believes that the booming driverless car industry stands to benefit from a nuanced perspective of ethics and policy, and that the tech and non-profit sectors can work in tandem. 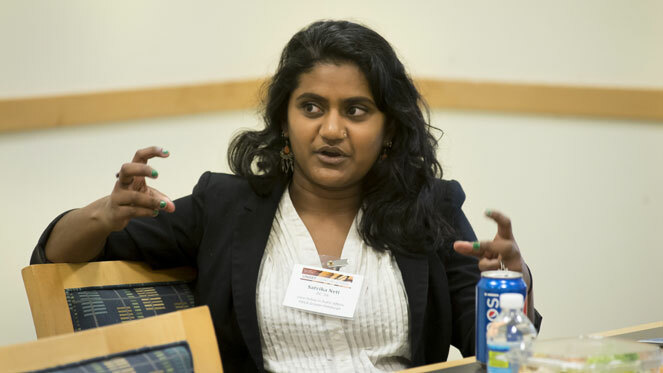 At CMU, Neti did this by helping to organize Beyond the Binary, part of the 2016 Tartan Hacks event that challenged participants to use technology to prevent sexual assault and relationship violence on college campuses. Geoffrey McGovern, a lecturer in the Institute for Politics and Strategy, advised Neti on her senior honors thesis, which explored the meaning of activism in the age of social media.